Hallelujah, the asparagus is here! That delicious harbinger of spring. That promise of tasty fresh produce to come. This week’s French Fridays with Dorie recipe, Asparagus with Bits of Bacon, was the perfect warm weather welcome. As I think I have mentioned before, asparagus in Germany is almost always white. In fact, a homesick american expat in search of green asparagus could find herself laughed out of the produce aisle. Sigh. If you are unfamiliar with white asparagus, let me just tell you that it is a tad higher maintenance than green asparagus. To begin with, it has very tough skin and must be peeled before cooking. Luckily I was able to get the resident German to tackle that job for me. And then it needs longer to cook, my chubby spears took about 12 minutes. Dorie’s recipe calls for basic boiled asparagus to be dressed in a simple vinaigrette and then topped with crispy bacon and sauteed onions. Sounds lovely as is. But I thought that it would be even lovelier with a fried egg. As strange as it may sound, one my very favorite springtime dinners is sauteed asparagus with poached egg. The flavors pair perfectly and make a quick but delicious weeknight meal. So why not try it with a little bacon throw into the mix? Why not indeed! This meal was a delicious and welcoming transition into spring. I look forward to much more asparagus to come before the season is over. This entry was posted in french fridays with dorie and tagged Around my French Table, seasonal - spring. Bookmark the permalink. LOVE the idea of this with a poached egg and I thought about doing it too. In the end I just ate this out of the pan so no time for the egg. But next time. Definitely. THe egg is a lovely idea. I love the look of the white asparagus… it wasn’t on sale so I went with the typical green 🙂 And thank goodness for helpers in the kitchen! I love asparagus, and the white asparagus looks very elegant! We have a 4 day Easter weekend here in Australia too, have a great Easter and enjoy the break! might very soon. This year I was able to find very thin green and they cook so quickly. Lovely, and I love, love fried egg. Will try this soon. I didn’t even know there was such a thing as white asparagus! You learn something every day I guess. Eggs are my new thing so I think I will definitely try your suggestion next time! Maybe that’s why I never liked white asparagus. Didn’t know I was supposed to peel it, and didn’t know it took longer. No wonder I always thought it was tough. HA! I planned to make this with eggs for breakfast, but boy-o has a stomach bug, so it’s not gonna happen. I’ll get to it eventually. Very creative! How interesting that you can’t find green asparagus easily in Germany. We love spargel around here! Yours looks lovely. Happy Easter! I thought about getting white asparagus, but I thought against it. I’m glad you did. The dish looks great! I remember snatching up white asparagus the first time I saw it…so exotic over here 🙂 Your dish is gorgeous with the addition of the egg. Wishing you a very happy Easter! I’ve never cooked white asparagus, I’ll have to try it next time. I loved Dorie’s Egg, Bacon and Asparagus salad that we made last year, Rose, so I don’t blame you a bit for adding an egg on top of this one. It looks so delicious with all that runny yolk! It makes for a wonderful light meal for spring. I hope you have a lovely Easter! How interesting – you know, I have never seen white asparagus. I agree that this was a tasty meal. Happy Easter! We made almost exactly the same dish! I topped mine with a fried duck egg (using the extra bacon fat, of course). 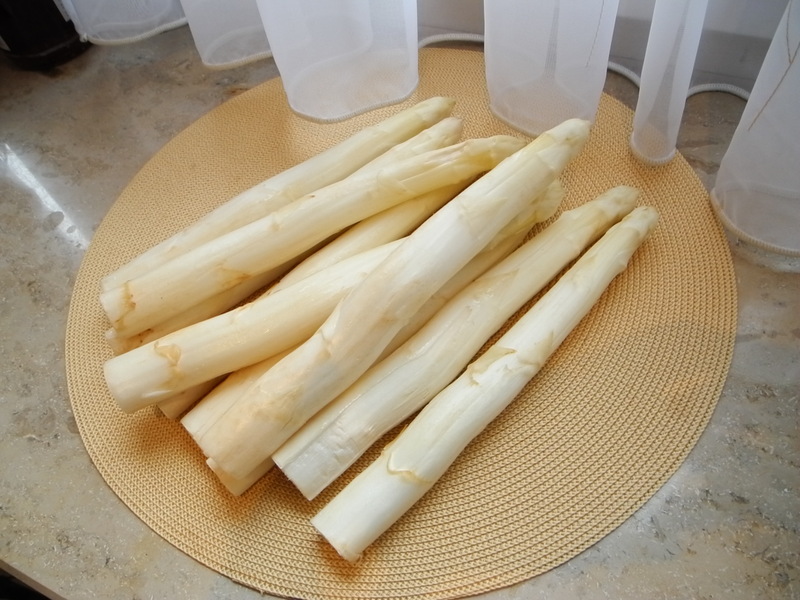 I thought of white asparagus immediately when I remembered you’re living in Germany. They are such a treat though compared to the more common green ones here in North America! I still remember how precious the white ones are when they are in season in Paris. Featured in almost all the restaurants and gourmet takeout places with fancy price tag to boot! Love your photo and the contrast of white and yellow. I’ll have to seek out some white asparagus now! I love how you made this into a meal with an egg on top. Brilliant! I’ve never had (or seen) white asparagus, but I remember when my mom was living in Germany (near Heidelberg) she talked about the white asparagus festivals in the spring. Hope you enjoy every minute of your extra long weekend. I’ve never tried the white version, does it taste the same? Looks great with the egg atop it. I love eggs and asparagus together – and your fried eggs looks perfect. 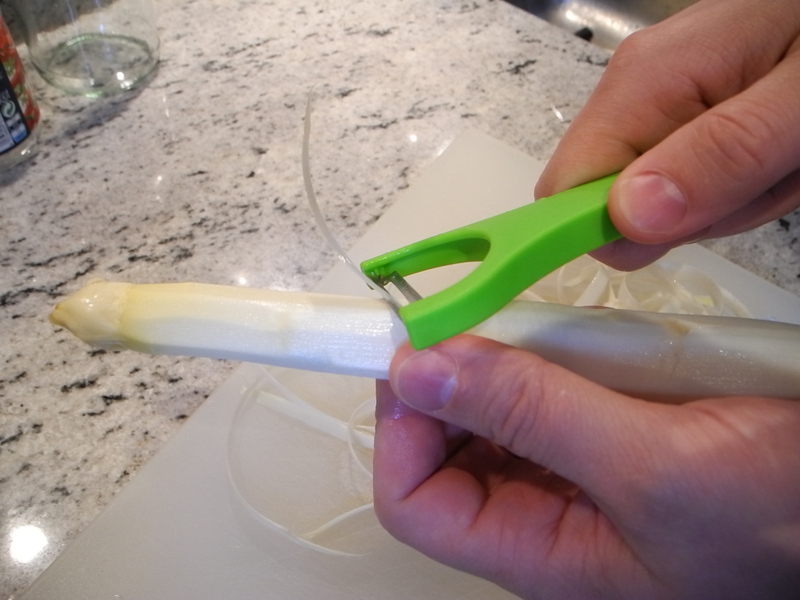 Great idea…How does the taste of white asparagus compare to green? My husband and I were just discussing this, but I don’t know if I’ve ever had it. White asparagus does taste different from green, but aside from saying that it has a milder flavor, I’m honestly not sure how to describe the difference. I’m no expert, but I believe that white and green asparagus are actually the same plant and it is only the difference in how they are grown which changes the color. White asparagus is grown completely underground and green grows above ground. 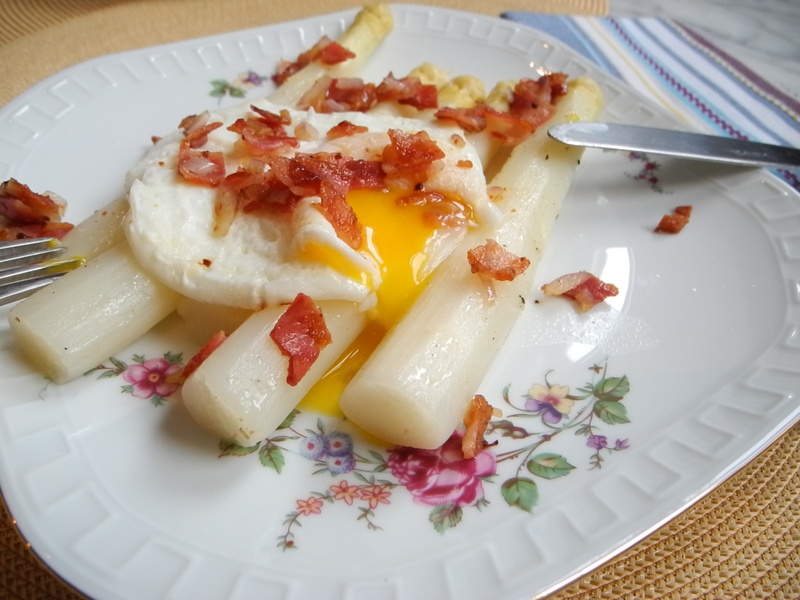 Every european I know thinks that white asparagus is far superior (including my husband), but I actually find that it doesn’t taste like asparagus to me and I find myself missing the green stuff sometimes. Beautiful – the composition with the white asparagus and the egg yolk spilling over looks terrific! We love both green and white asparagus! GREAT idea to add an egg to this! I may steal your idea. :). Interesting that green asparagus is so hard for you to find…I would miss it too.